This week’s episode of “Brooklyn Nine-Nine” was all about chocolate milk, vasectomies and old rivals. The episode begins with the entire precinct learning of Terry’s scheduled vasectomy, which no one (except Boyle) thinks is a good idea. However, after they get all the vasectomy puns out of their systems, they’re distracted enough to forget about it and focus on more pressing issues. 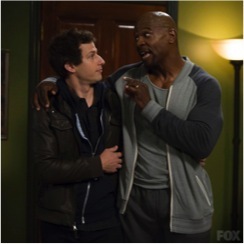 When Jake is assigned a “dope” stabbing case surrounding the owner of a chocolate milk restaurant, he invites Terry to join him since, according to Jake, “Chocolate and Milk” make such a good team. Terry agrees, but is on a time crunch since his neighbor is driving him to his operation that same day. When Jake offers to drive him instead, Terry claims that he never thought of Jake as “that kind of friend,” which obviously leads to Jake going to great lengths to prove he’s every kind of friend. At the doctor’s office, a drugged up Terry’s operation is rescheduled because they didn’t have the massive amounts of anesthesia needed to numb his equally massive body. He’s still pretty out of it, since he admits to Jake that he doesn’t actually want the procedure but instead wants to have more children. A confused Jake has to juggle his new friendship duties with the ongoing stabbing case, which is proving to be more difficult than expected when their only lead – the owner’s business partner, Gregory – has an alibi. Meanwhile, Boyle is facing his own crisis, as he’s struggling to find a date to his ex-wife’s Jamaican themed engagement party. He asks Gina, assuming that since they’re now “bone-bros” (a comment that earns him a swift slap to the face), she’ll accompany him. She obviously rejects him, since she wants zero association with him outside of their secret sexual relationship. Boyle then asks Rosa, who not only rejects him but informs him of how ridiculous it is that he’s going to his ex-wife’s engagement party. When Jake confronts Terry about his confession at couple’s counseling (I was confused as well), Terry denies it and asks Jake to stay out of his business since they’re just work friends, not actual friends. Jake refuses to believe this, and instead attempts to physically overpower Terry (“I’m only trying to protect you from your stupid self”). He fails miserably and hilariously, and Terry leaves with plans to go through with the procedure. Santiago manages to save the day at the precinct when she finds the old letter of recommendation that caused the Holt-Wuntch feud and reveals that it was actually very positive. Wuntch is outraged that Holt thought she resented him for being gay, causing him to point out their many other past issues. She shot him, he embarrassed her in front of Derek Jeter, the usual. 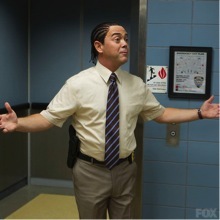 In preparation for the Jamaican themed engagement party, Boyle gets cornrows and continues his desperate search for a date. In the end, Rosa agrees to go with him but makes him promise that he’ll move out of his ex-wife’s basement, since she’s not just his ex-wife but his landlord as well. His ongoing relationship with Gina remains a secret, but I’m sure that won’t be for too long since nothing stays too quiet for long at the precinct. Jake shows up to Terry’s surgery with the full intention of just being his support system, but as Terry’s being wheeled into the operating room he changes his mind and Jake has to get him out of there, proving to Terry he’s more than just a work friend. Everything is wrapped up quite nicely, with Terry and his wife deciding they’re going to wait to have the operation, Gregory’s alibi falling through and him eventually confessing, and the precinct getting an evaluation score high enough for Holt to stay in command. Overall, despite the episode’s ridiculous premise, the focus on the different relationships within the precinct and some of Holt’s backstory brought it back down to Earth and made it enjoyable from start to finish.